Fall also holds a very special place in both the hearts of my husband & I. We were married in the Fall 5 years ago in October. So here we are, celebrating our 5th year wedding anniversary. We decided to go back to where we celebrated our 1st wedding anniversary--a quaint & quiet bed & breakfast in Pocono Pines, PA. The foliage during this time of year in Pennsylvania is absolutely gorgeous. We took this picture in the same exact spot that we took a photo 5 years ago. We're even wearing the same clothes! :-) Here's a page I did based on our 1st wedding anniversary--you'll notice that both our outfits and the background scenery are pretty much the same. 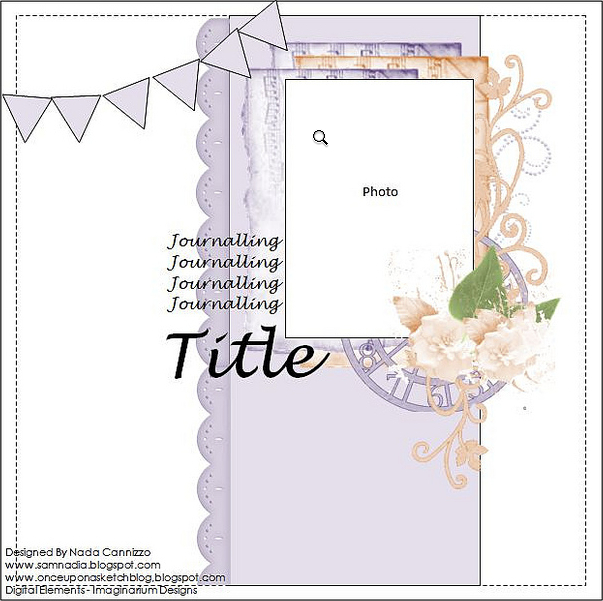 This is also a DT page for Clear Scraps & I'm entering this page in the most current challenge going on over at Bird Is The Word (BITW). The theme is Seasons--Winter, Spring, Summer or Fall. I've used one of Nadia's sketches from an older OUAS challenge for my page. Something that has become very routine with me lately is to store my journaling in the form of a scroll. I have a brief tutorial on how I go about making my scroll journaling right here on my blog. You can find the tutorial here. I had a good amount of story telling for this page & storing the journaling in the form of a scroll doesn't take up too much space on my page & makes for a unique embellishment! The number '5' represents the number of years we've been married. I added simple texture to my number--I inked up the number with embossing ink & heat embossed it with Star Dust embossing powder by Stampendous. In person, this number gives off a lovely shimmer. Here you can also see a small glass vial that I filled up with colorful beads from my stash. I tied a bit of twine around the neck of the bottle. The twine is from Riddersholm Designs. A long strip of dark orange burlap ribbon is in the foremost background of my page. I used a couple of ivory colored rosette flowers, mini pinecones & other random Fall themed embellishments from my stash. The fabric dark brown leaves are by Prima. This large fabric orange flower is by Prima. I tucked a bit of yellow & green tulle underneath this large flower to soften the page a bit. This is the acrylic Pennant Banner by Clear Scraps. I altered this banner in several ways. First I colored them with several alcohol inks. I used Lake Mist, Copper, Meadow & Sunset Orange alcohol inks. On some of the banners I randomly applied drops of alcohol ink directly from the bottle. This creates more dramatic designs on the acrylic. Next with my crop-a-dile I punched 2 holes into each banner, ran green ribbon through them & finally a string of dark brown burlap twine to hold my banner together. Last step was to add dots of Gold Stickles all along the edges of each pennant in order to define them more. This flower was handmade. I used a piece of a 12x12 Acrylic Sheet by Clear Scraps to create it. I shared a tutorial on how I created this flower over on the Clear Scraps blog. So if interested, feel free to check it out. Thanks to all of you who stop by for a visit. Enjoy the rest of the week! Wow! what beauty! amazing work! This looks so lovely, so many details and a lot of thought has gone into this layout to make it so very special..and thanks for joining in at BITW!! Gorgeous layout, colorful and with a lot of layers. Gorgeous LO,Thanks for playing with us at BITW!!! This LO is sooo stunning - I love it! wow wow wow what grogeous gorgeous colours!!!!!!! !fabulous layout love the details! 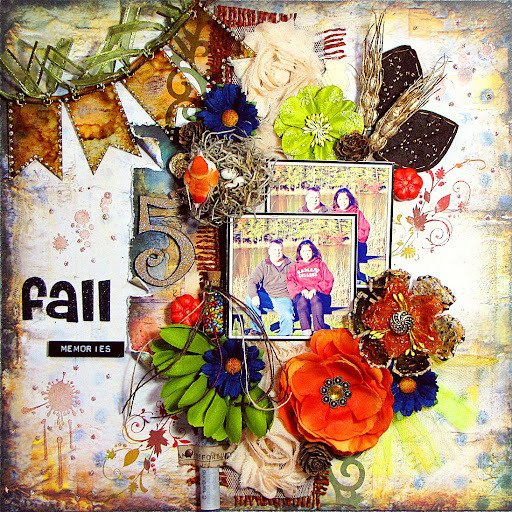 Gorgeous fall page, Kay!!! love how you mixed different textures in your page and Thanks for playing at BITW!!! !